weekend offered the perfect opportunity. Have you been participating in the Great Backyard Bird Count? Honestly, I did not embrace the GBBC with all my heart. This weekend was dedicated to enjoying the company of my visiting mother, brother, sister-in-law, and niece. Consequently, I spent lots of time in non-birdy environments. However, I did carve out time for a quick twitch once Corey alerted me to a convenient first-year male King Eider up on Lake Ontario. 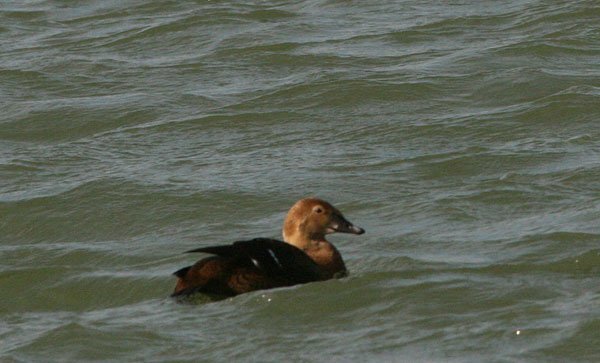 The gender of this duck drove my decision, since I swore I would not be moved to chase a drab eider hen, even if it would be a life bird. The joke was on me though; after employing the persistence and patience most twitches demand, I finally got my bird… a proud Queen Eider. Dash it all! The bird I couldn’t ID! I have no picture, but floats like a goose, except a lot lower, body almost entirely in the water. What I could see was grey with an orange beak. West Coast of Canada, mixed salt-fresh inlet. Couldn’t find it on my GBBC cheatsheet… Oh, and it goes underwater for long periods of time. I think the herring are in town. Clearly the many – yes, truly many – Hawfinches that sit and fly around everywhere in Heidelberg at the moment. Neat birds. @PortageBirdLady: maybe an immature Double-crested Cormorant? The immatures can appear very brownish-grey, and an orange beak sounds very much like DC Cormorant. We saw four gorgeous wood ducks on Shoal Creek just a few blocks from our house. Didn’t get to do much birding this weekend. I spied a male Eurasian Wigeon at the local duck pond among the Mallards, Coots, and Canada Geese. My best bird this weekend was Cedar Waxwing! I had never seen one before and was so thrilled to see a small flock! 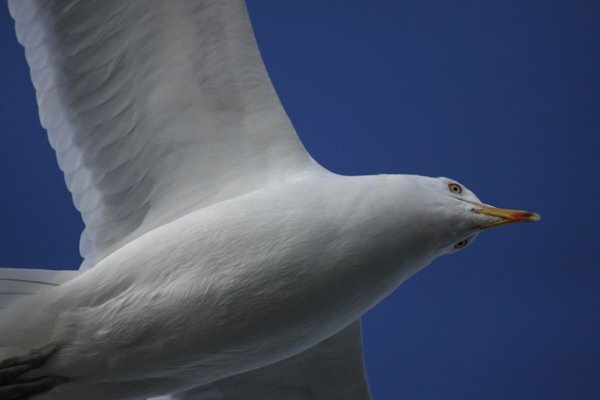 Such a lovely bird. @Dawn Puliafico: Congratulations on your lifer! Aren’t Cedar Waxwings gorgeous? I’m glad you got to see them! @Jochen: Thanks! The DC Cormorant was the closest I could find, so that’s probably it. Will have to brush up on my juveniles! Thanks for responding! Congrats on the Queen Eider! Way to get a lifer during a family visit. In Costa Rica, a displaying Resplendent Quetzal on Irazu volcano was awesome as were Snowcap, male Black-crested Coquette, and Yellow-eared Toucanet in Braulio Carrillo National Park. There’s been a Harris’s Sparrow hanging around near Kempton, PA since sometime in November. I finally found time to go look for it this weekend. Having never seen one before this year, I’ve now seen two, one near home and one in California last month. No pictures unfortunately, due to my good camera breaking last month. Patrick, thanks for the congrats but you know I would much rather have seen the birds you saw. Gotta get to Irazu!